In 2006, I wrote a memoir about my first year creating and running the Shakespeare Club at a Los Angeles public school. In 2007, I met a literary agent who read my manuscript, called me to say it was "fresh, solid, original and delicious" — who the heck doesn't want to hear that? — and said she wanted to represent the book to publishers. In 2008, the Great Recession hit and the book was not picked up by any editors. In 2009, my agent suggested I start a blog — this very site — and I did, publishing posts about my fourth, fifth, and sixth years of running Shakespeare Club. 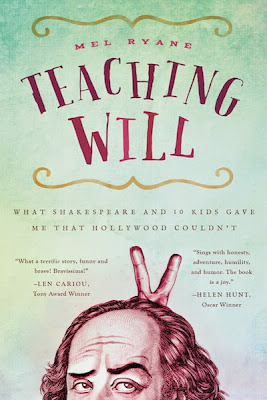 In 2013 — wonder of wonders — a publishing house wanted Teaching Will: What Shakespeare and 10 Kids Gave Me That Hollywood Couldn’t. In 2014 — on August 12 — that book is born. I'm not claiming to be remotely close to the genius of Shakespeare, but we have at least one thing in common: He had to bide his time, and I identify. He started as a water boy in the theatre. He had to run around doing errands for the higher-ups, all the while watching and listening to the works of others. Then the Black Plague hit, theatres were closed and he holed up in a turret, writing poems for cash. William Shakespeare kept writing while he was forced to be patient. He honed his craft and we reap the benefits. I wonder...I wonder if he knows that over 400 years later, how many of his plays are on stages all over the world, every single minute of every single day? Shakespeare is fun. I like it because Shakespears words are so so pretty. I also like the plays romeo and Juliet, Hamlet, and Misdummers Night dream. Shakespeares words are so butiful and pretty did I mention that already. 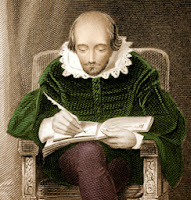 I joined the Shakespeare Club for two years because the shakespeare club sonded very fun.